Retired Diplomat Bruce Haigh, speaking at the 'Mudgee Muster', the Rural Australians for Refugees' first Annual Conference. For details click here. "For refugee advocates to slug it out with Ruddock plays into the hands of Howard. It keeps them occupied." For many people in the refugee movement, following "the slippery minister", his press statements, the reviews, court cases and announcements, indeed puts them on a slippery path. Not a day seems to go by without new developments, changes to circumstances of refugees and asylum seekers, and to the Migration Act - or as someone, I believe it was Margaret Piper of the Refugee Council - called it, the 'shifting sands of the Migration Act'. The contribution below by Bruce Haigh puts the attention and focus back on to "Ruddock's puppet master: Australia's PM 'Honest John' - John Winston Howard. 9 March 2006: The fall-out from the Cole Inquiry - former diplomat Bruce Haigh, who's from a family of farmers in WA's Western wheatbelt, ponders about the Cole Royal Commission into the Australian Wheat Board and it's mainly negative fall-out that will not help the farmers in Australia. Some people in the refugee movement, including Rural Australians for Refugees, believe that they are involved in a single issue campaign, namely to change refugee policy. However they are not. The parameters are much broader. They are fighting a mind set which has affected the opposition just as much as the Coalition. On major issues the Labor Party has either gone along or agreed with the government. With many of the checks and balances on power marginalized, our democracy is becoming increasingly fragile. Howard has ruthlessly exploited power accumulated in his office by earlier prime ministers and has significantly added to that power. Most recently he has formed a body within his Department called the National Security Division (NSD). It has as its operational arm the Australian Federal Police (AFP). This is the first time in Australian peace time history that an Australian prime minister has control over a police force. And he is using it to implement Australian foreign policy in the Solomons and Indonesia. Howard has effective decision making control over most ministries, particularly Foreign Affairs, Defence and Immigration - especially matters relating to refugees and border control. Few decisions are made without his direct input and some are made without any input form the relevant ministry. The decisions on Tampa and SIEV X are cases in point. Howard's acquisition of power and the misuse of this power have been significantly enhanced by the hysteria whipped up over the "war on terrorism" of which he has been the main architect. In order to bring about change in refugee policy Howard must go. Howard is the main obstacle to innovative and enlightened change. He is the stumbling block toward implementation of progressive and visionary policies, whether that be refugees, water, national infrastructure, education, health and low cost housing. Howard is not bright but he is resilient. He has the capacity to wear down opposition. He has the cunning of a con man. Anyone can appear smart if they are prepared to lie but as a political tool it will eventually deliver its own reward. Howard's acquisition of power has been incremental. He takes a step forward and waits to see how much flak or applause he attracts and the strength of the response determines the next step. He does not willingly expose himself. Denial has replaced accountability. He is aided by a politicized public service, shock jocks, right wing tabloid, journalists and an intimidated, mediocre and middle class mainstream media more concerned with Australia's economic boom and property prices than giving Howard a run for his money. Know your enemy. Without Howard other ministers would amount to little. Howard's unbridled and unchallenged acquisition of power will eventually be his downfall, but with the AFP and the military being used to prop up his regime don't hold your breath. For refugee advocates to slug it out with Ruddock plays into the hands of Howard. It keeps them occupied and off his back and it ensures that for as long as he is around, refugee policy will remain unchanged. Refugee activists should be prepared to take the fight up to Howard on any issue where opportunity presents. Refugee activists need to broaden the base of their activism into a political movement. Bruce Haigh is a retired diplomat, who has also worked and lived in South Africa under Apartheid, where he was part of the resistance movement, and a close friend of Steve Biko. 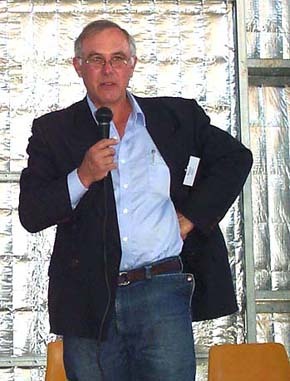 As a result of also this strong connection to Steve Biko, Bruce was amongst the cast of the movie Cry Freedom. He has also worked as a member of the Refugee Review Tribunal. He now lives and farms in Mudgee. He formed the Mudgee Rural Australians for Refugees group and has served on the national committee of Rural Australians for Refugees. He was in Perth, WA, as the Moderator of Project SafeCom's Symposium Forum "The Bill: Restorative Justice post Howard" on 28 September 2003. Around this time Bruce became part of Project SafeCom as an adviser to the steering committee, especially on political directions. More information about Bruce and our Symposium on the pages related to this event.